It doesn’t matter if you’re naughty or nice when brunch is this good. Three words: blue cheese hummus. That's what you'll come out of Naughty Boy repeating — over and over, like a prayer or incantation — if you make the right move in ordering the cauliflower and hazelnut fritters with poached eggs and a fennel salad. The addition of hummus and blue cheese together (at last!) is such a perfect marriage, you'll wonder why you hadn't thought of it yourself. It's not a brunch dish likely to be superseded in a hurry — except perhaps by something else on the very same menu. Because while blue cheese hummus is undoubtedly incredible and it's a great introduction to Naughty Boy, there is much more to love at Princes Hill's new (and we're pretty sure only) cafe. Having been open for almost three months now, the cafe has found its rhythm, and come the weekend, the 100-seater space is pretty much full. The menu — which spans breakfast and lunch — is one of those that caters to each one of your gastronomic sensibilities. Choosing is the hard part. Sweet is covered by a coconut and lime rice pudding with rhubarb and candied almonds ($12.90), and — when we visited — a pancake special. The Bircher with muddled spiced berries and pistachio ($10.50) takes a more virtuous path; oats are subbed for quinoa and chia seeds, making it grainy and wholesome. It's also one of the many gluten free options. Savoury is where the focus lies though, with the aforementioned fritters taking centre stage, along with twice-cooked pork belly and a breakfast Scotch fillet and fried eggs. The Naughty Boy is a platter set to please, with bacon, tomato, falafel, mushroom and eggs ($20.90) — just be sure to add a side of bacon and gruyere croquettes. Coffee is from Allpress, but you might also find a guest blend, like Dukes, on offer. The cafe is licensed too, which means lunch can be accompanied by a beer, cider or one of the few wines kept in-house. 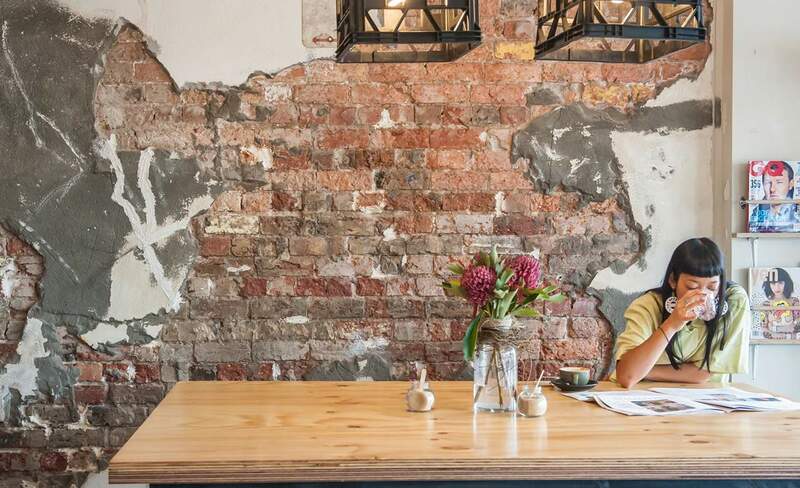 Naughty Boy is perhaps a bit ambitious — the space is big and risks looking empty out of peak weekend hours — but it fills a void in the surprisingly cafe-barren stretch of Lygon Street that has long been monopolised by North Carlton Canteen. Above all else, this is Melbourne breakfast at its most pleasing, and it is a menu that can be revisited again and again.